This case study kicks off a new series at Copyblogger: Real-world stories of people like you who have used the “Copyblogger method” of content marketing to strengthen their businesses, launch strong new projects, and do epic work. We’re starting with the story of versatile content marketer Aurélien Amacker. Sonia Simone met him at a marketing conference late last year, and they immediately hit it off. Aurélien was a great example of someone who had refused to fit himself into the comfortable, cubicle-shaped box that was expected of him … and has made a great business and life for himself. He’s entrepreneurial, a nonconformist, but also an eminent pragmatist. He’s also a longtime Copyblogger fan, and he’s based his content marketing strategies on the ideas he’s been reading on this blog. And he’s living proof that content marketing transcends culture. Aurélien lives and writes in France, but he could as easily be in Brazil or Japan or Norway or South Africa. Like the rest of us, he listens carefully to the needs and desires of his particular audience … and then gives that audience precisely what they’re craving. What is your site, and what do you write about? I own four blogs — one is about personal development (how to get out of the cubicle), two about internet marketing (how to make money online), and one about learning English. I left university without being able to speak English, and I learned it on my own. What kinds of content are most important to your business? Blog? Email list? Both are important because the blogs allow me to build my list and create a relationship with my readers, while the emails I send to my list allow me to nurture the relationship and make money. Who are your readers and how do you serve them? Mostly they are people trying to get more of their life. They are not satisfied with their job or they want to make extra income so they can live their dreams. Here in France TV newscasters are so pessimist all the time. All they can talk about is the economic crisis. It’s so depressing. So I think people are starving for more optimistic ways of looking at things. I try to inspire them with my articles, or to teach them something of value (like how to start a blog or how to speak English). I sell products to teach people how to make money blogging. Do you think blogging is different in France than in the U.S.? I think it’s the same. Most of the bloggers are amateurs just willing to share their thoughts online. Then a few bloggers try to make a living out of it by publishing great content, attracting traffic and then monetizing it. On the French market, we are lucky though — because the Americans are more advanced, we just have to watch what you do and do the same. It’s like having a crystal ball! I started my career as a systems and network engineer. Then I tried to work in sales, but I got fired after six months. So I went to Australia, where I spent two years. When I came back to Paris, it was clear to me that I didn’t want to go back to a corporate job. So I started looking around for another opportunity. Funny story — because it all happened in one day. Six months after I came back from Australia, I hadn’t yet found an opportunity, so I started to look for a job in the corporate world. One company offered me a job with a very good salary, but the same day I had lunch with a blogger who was making (at that time) about 500 euros a month. I had been blogging for two years at that point, but I didn’t have many visitors (like 5 or 10 a day) and I wasn’t making any money from blogging. But I thought, “Hey, if I start working full time on my blog, I think I can do better than this blogger.” (He was running his blog as a side gig from his day job at that time.) And if I tried full-time blogging, I could keep traveling. So I declined the job offer (one of the toughest decision I’ve ever made — my mom wasn’t too happy about it) and I decided I would dedicate one year to traveling and trying to make money out of my blog. Having a “What-is-the-worst-thing-that-can-happen?” mindset is very powerful when you need to make decisions. What did you learn that helped you when you were getting started? I was very dedicated, so I met all the bloggers I could, so I can learn from them. I also invested in my first online course — it was Yaro Starak’s Blog Mastermind. I learned how to drive traffic to my blog, how to monetize the site, and how to improve my positioning. But you know what? Most people fail not because they don’t know what to do — but because they don’t do it. And because I had no choice, I kept doing it. And that is why I succeeded. For any business, the hardest part is getting started. And working online is fighting against yourself. So I learned a lot of techniques to be more productive. With time, I also learned what strategies are efficient to grow an online business and what strategies aren’t. Now as my business grows, I’m facing different challenges (I’m now managing a team of two) but I love to learn and I’m passionate about what I do. How important is your blog to your business? My blogs allow me not to depend entirely on my affiliates to get leads. Plus it’s a way to position myself on my market. It’s pretty modest compared to what I see in the US. [Editor’s note: Actually, a lot of U.S.-based businesses would be delighted with Aurélien’s revenue numbers.] Every day about 5,000 people visit my blogs, and 100 people subscribe to one of my newsletters. I’ve got a list of customers of about 1500 people. What’s next for you? What are your upcoming goals? Like a guitar player, I want to master what I do. So I read one book every week about personal development or marketing, to learn new stuff and keep me inspired. I’m lucky to have two amazing guys on my team, and I want to take them as far as I can. So I want to grow my business as much as I can. But it’s not about money. My business allows me to live the life I was dreaming of when I was stuck in an office six years ago. Last month I was in the U.S., this month I’m in Colombia, next month I’ll be back to France. I can work whenever I want. I can cook my lunches, so I can eat healthy food. I can take a nap after lunch. I can wander in the street while everybody is at work. I can work out every day. Plus I love my work. I love to learn. I love the people I work with. 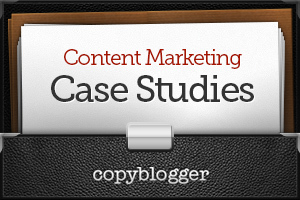 This post is the kick-off for our new series of content marketing case studies. Over the next few months, we’ll feature inspiring stories of bloggers and content creators — and we’ll be asking them to share their success secrets with you. To get the full series, watch for future posts here on Copyblogger. If you’re not already subscribed, sign up to get new posts delivered straight to your inbox. Hi hope this interview motivates people to take action, because at the end of the day what matters is what you did. As Woody Allen said: “80% of success is showing up”. So show up every single day and you will succeed, no matter who you are and what you’ve got. Thanks for letting me grill you. 🙂 So many people have told me, “I don’ think content/blogging works in my culture,” I’m hoping this will widen some perspectives. You’re welcome, Aurélien — thanks for sharing you story with us! 🙂 It’s very inspiring! Thank you Aurelien, Sonia, Beth and everyone at Copyblogger! This story in particular resonates deeply with me. I just turned in my 2 weeks notice and am pursuing my own content and inbound marketing venture. I’m a little anxious but I knew it was the right thing to do , and reading this post has strengthened my confidence in my decision. Copyblogger was the first blogging / SEO copywriting website I came across when I started my job as a trade rag assistant editor 2 years ago..and it still remains my go-to source as I’m getting ready to launch my own business. Thank you all very much! You’re welcome, Michael – congrats on quitting your day job! Yay! I love this concept! Inspiring story–congratulations on creating your dream job, Aurelien! I’m going to be worthy of one of these someday. Just wait. Hey Sonia. Anytime I hear about someone meeting someone and then helping that person achieve their dreams I get a warm feeling inside. I’m a firm believer that people don’t care about how much you know until they they know how much you care. Great job on on your success story. i didn’t discover Aurelien in this post, though he is my coach in blogging! Finally the methods AA teaches are similar to those you suggest! How can i make know my writing to americans readers? I administrate a blog and i wrote a book on the subject “how i healed my cancer, and my theory about cancer development” which may interest a lot of your compatriots! thank you or your proposals. Hi Daniel – I highly recommend you get our free report about SEO copywriting, which is a great guide to writing blog posts that get found in the search engines. Best of luck! Nothing better than reading a story about someone living the life they dream. Great kick off to the series! world. I’m just a beginner and wish for the best every day. I always get excited when I see another writer featured in a copyblogger interview. Keep this type of content coming! A fun read — and inspirational too! “It’s not about money anymore. It’s about being happy” -> How true this statement is! I think a lot of people can relate. Cliche as it may be, money really can’t buy happiness (travel, time to workout, time with family, time to NAP!). Thank you for doing this interview. Aurélien is among the best teacher in Lifestyle Business and Blogging !! So excited to see him here and to see a Frenchman in such a big blog as copyblogger !! I’m going to love the Case Studies format! I’m on Aurélien’s list since a few months, and I like what he presents. A truly inspiring story. Sometimes, you can only but imagine how people are able to traffic these numbers daily, and still eke out a living doing so. I am honestly inspired. I have just been a recent convert to copyblogger; subscribed to IMSP and Entreproducer. I live and work in Ghana. Thanks Sonia, thanks Copy Media. Awesome, awesome interview. Just opened my eyes to what	I need to do. I too quit my job recently to follow my passions, but I’ve been delaying the launch of my blog for one or the other reasons till today.. guess I gotta push it out..
That should inspire anyone not giving it 100% to raise their game! I too started out with the premise of “How badly can I possibly fail?”. Good post! Thanks very much Sonia and Beth. i love these REAL stories. I relate to them because the formula is the same as becoming a professional athlete….and that is you have to do something every day that takes you another step forward towards your purpose – even if that is making one phone call, writing an email, when everything seems to hard – if you do something everyday you will get there! Momentum is the key! That’s awesome that Aurelien is able to get that kind of traffic from just 4 blogs. I guess authority blogs are the best way to go. Hi Megan, actually you don’t even have to own an “authority blog” to drive traffic. On my blog that teaches english I’ve been publishing blog posts optimized on long tail keyword and doing this constantly I’ve been able to drive more than 1000 visitors a day in less than 12 months with about 90 articles. I think we tend to be obsessed by the quality of the blog posts we publish but I think we should instead publish a lot of content to drive traffic, and THEN we should do our best to create irresistible offers that will convert this trafic into real, tangible money. This is the approach I’m now testing on all my blogs. After all, once somebody is on your list all the money you make is up to the offer you’re gonna show him. I like this type of success story of people who quit their regular job and succeeds on-line. It gives me hope to continue the struggle each day, hoping to succeed as they did. Thanks for the amazing testimonial about the power of focusing on a dream! I commend you Aurelien for staying the course and finding your true happiness. Keep the inspiration flowing and alive. Very good interview, I am very pleased that a person who is close to my country to succeed as a blogger. Aurélien is a very intelligent entrepreneur who knows how to capture value from a project and share it with customers. This is a beautiful article. Should have been titled “From Paris with Love” or Inspiration, if you like. Aurelien does his country proud by featuring on copyblogger and through his work. Perhaps he can give us links to his blogs. Does he write them in English, or what? That he’s from France shows that blogging “trascends cultures” and sometimes we, from across the world, think it’s only Americans who can succeed. Thanks to copyblogger and Aurelien, this article has united us: I see comments from Ghana and Spain. Me, myself, I’m a freelance copywriter from South Africa. From this beautiful article I’ve resolved to do the finishing touches for my wordpress blog. Thanks for the inspirational interview. Life is indeed greater than just sitting in the cubicle. !! And this life has given all of us an opportunity to live our dream life!! everyone of us can do it!! Great interview! Very apparent how personality comes through clearly in writing and, especially, on blogs. This is a great interview, and an equally great idea for a blog series. Thanks for sharing with us. Unlike some of you brave souls, I didn’t quit my job by choice, but because an injury will prevent me from doing it in the future. After I spent some time quite worried about anything I could think of, I realized that I had the perfect opportunity to pursue what I love doing. I opened an internet-based business and started learning how to work on the web. This is very new territory for me, but, like Aurelien, I am an avid learner. So, everyday I learn some more. I am still trying to get people to my site, but am confident that my work will pay off in the end. One of my favorite quotes is by Seneca: “It is not because things are difficult that we do not dare, it is because we do not dare that they are difficult.” As I am learning, setting up a website and starting to write blog posts isn’t actually as difficult as I always imagined! Thanks again. Reading stories like this help remind all of us that there is a payoff to hard work. As one of your customers, I learn so much from you. Thanks to your advice, my blog keeps growing, week after week. Looking forward for our next meetup ! I think your blog is performing a great service by featuring such stories. You should profile more nonconformists and creative people on your blog…how they got from point A to point Z and achieved their goals. It is inspiring to read such profiles and “rags to riches” stories. Please keep up the good work. Cheers.